Transparency Market Research (TMR) has published a new report titled, “Tissue Banking Market - Global Industry Analysis, Size, Share, Growth, Trends, and Forecast, 2018–2026”. 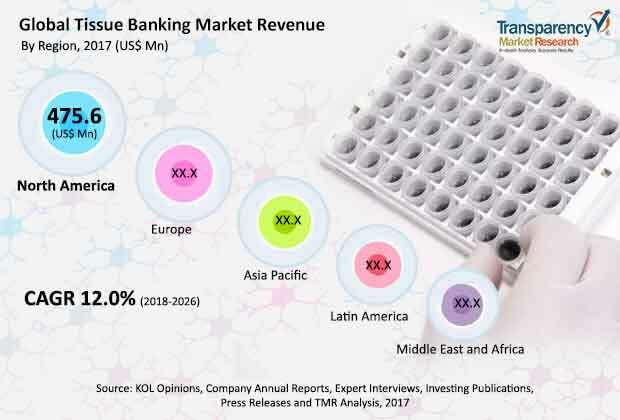 According to the report, the global tissue banking market was valued at US$ 162.3 Mn in 2017 and is anticipated to reach US$ 2,903.3 Mn by 2026, expanding at a CAGR of 12.0% from 2018 to 2026. Increasing demand for regenerative medicines, advancements in bio banking technology, increasing health care expenditure, and rising awareness are likely to fuel the global tissue banking market from 2018 to 2026. Regenerative medicine is the process of creating living, functional tissues in order to repair or replace tissue, which has been lost due to age, disease, damage, or congenital defects. Regenerative medicine has the potential to solve the problem of shortage of organs available through donation. Rapid development of transplant medicine along with the aging of the baby boomer generation has fueled the demand for tissues and organs far exceeding the available donor organs. Approximately 500,000 people in the U.S. benefit from a transplant each year. Regenerative medicine is expected to improve the quality of life of individuals by providing healthy, functional tissues and organs. This is likely to propel the tissue banking market during the forecast period. Advancements in biobanking technology have improved the new areas of science such as biorepository and biospecimen science. Usage of robotic sample handling and processing, along with software specifically designed for storage management in the facilities is anticipated to make the biobanking process easy and effective, as biobanking expands. For instance, in July 2018, PHC Corporation introduced the new -85°C ultra-low temperature freezer VIP ECO series 1 using natural refrigerants 2 and new inverter compressors for the market in Japan. The complexity and novel applications of human cells, tissues, and cellular and tissue-based products (HCT/Ps), however, presents potential risks. The U.S. Food and Drug Administration has established a tiered, risk-based regulatory structure, in which more rigorous controls and safeguards are required for products. The proposed good tissue practices (GTPs) are intended to prevent contamination with infectious disease agents and to ensure that these cells and tissues maintain their integrity and function. These requirements are estimated to present significant challenges for clinician-investigators and laboratories. Product approvals and launch of medical devices are governed by various regulations established by the U.S. FDA and other regulatory bodies operating in each country. The U.S. FDA continues to increase testing and documentation required for the clearance of devices. Similar regulations are noted in the European Union (EU), Japan, and China. The various levels of approval processes can delay the product release in the market, which is likely to have a negative impact on revenue. In terms of revenue, the tissue banking market in Asia Pacific is expected to expand at a CAGR of 13.2% during the forecast period. Increase in product launches is expected to drive the tissue banking market in Asia Pacific. Increase in collaborations to promote tissue banking in the region and rise in awareness about the benefits of tissue banking among people in developing countries such as India is likely to drive the market in Asia Pacific. For instance, in March 2016, Panasonic Healthcare Co., Ltd. launched the new multi-gas incubator, MCO-170M Ideal, for various cell culture needs that require CO2 and sub-ambient or above-ambient oxygen control. The report also provides profiles of leading players operating in the global tissue banking market, which include Thermo Fisher Scientific Inc., Brooks Automation, Inc., VWR Corporation, BioLife Solutions, Inc., PHC Corporation, Custom Biogenic Systems, Inc., Bluechiip Limited, Merck KGaA, Beckman Coulter, Inc., and Hamilton Company.